The Mile High Jazz Band Association formed in 2001 as a nonprofit corporation to support the MHJB and its subgroup, the Millennium Bugs (jazz combo), promote live jazz performance in northern Nevada, educate the public about jazz, and enrich the cultural life of the community. Member benefits include mailings, discounts on admissions, and invitations to special events, plus the satisfaction of helping big-band jazz to thrive! To book the Mile High Jazz Band (big band) or Millennium Bugs (jazz combo), call 775-883-4154. MHJB has been performing since 2000 or so. Here is where you can find information on past performances. Click here for some 2006 performances. Click here for 2007 performances. Click here for 2008 performances. Click here for 2009 performances. Click here for 2010 performances. Click here for 2011 performances. Click here for 2012 performances. Click here for 2013 performances. Click here for 2014 performances. Click here for 2015 performances. Click here for 2016 performances. Click here for 2017 performances. Swing into the New Year with a Jazz Quintet from the Mile High Jazz Band at Comma Coffee on Tuesday, January 9, 2018, from 7:30 to 9:30 p.m. Comma Coffee, 312 S. Carson Street, is across the street from the state legislature building in Carson City. General admission is $5 at the door; free for age 18 and under. The program, Cool Jazz in January, presents favorite jazz tunes featuring Derek Fong on saxophone; Wayne Theriault on trumpet; David Bugli, keyboard; Frank Iannetta, bass; and Brandon Dodge, drums. 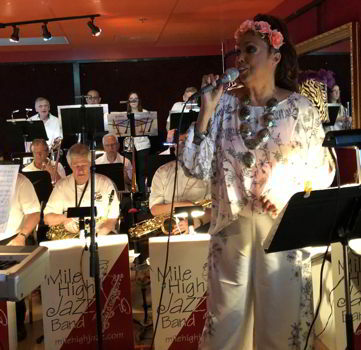 Mile High Jazz Band events are supported in part by a grant from the Nevada Arts Council and the National Endowment for the Arts. For information about Cool Jazz in January and the Mile High Jazz Band, call 775-883-4154, or see the website MileHighJazz.com. 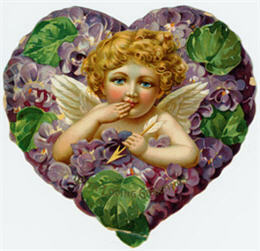 For information on other events at Comma Coffee, call June Joplin at 775-883-2662 or see the website CommaCoffee.com. 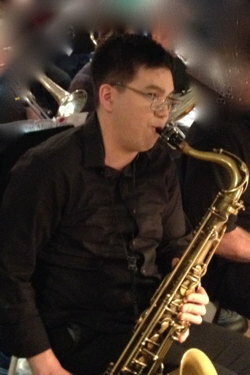 Photo: Saxophonist Derek Fong will perform with the MHJB Jazz Quintet at Comma Coffee on January 9. The Mile High Jazz Band and Carson Middle School Jazz Band present the 15th annual combined Jazz Extravaganza concert on Tuesday, January 30, 2018, at 7:00 p.m., in the Bob Boldrick Theater at the Carson City Community Center, 851 E. William Street, Carson City. The Extravaganza is sponsored by the Mile High Jazz Band Association as a benefit for Carson City school instrumental music programs. Tickets prices are $10 general admission and free for youth age 18 and under. Tickets can be purchased in advance from Carson Middle School music students, at the Nevada Day Office in the Carson City Visitors Bureau (716 N. Carson Street), online at MileHighJazz.com, or at the door. For information, call the Mile High Jazz Band at 775-883-4154. The Extravaganza will feature two big bands, combo performances, some surprises, and the traditional grand finale combining the forces of all the musicians. Refreshments and raffle prizes will be on sale in the lobby. "We're so happy to perform with the school jazz band again," said David Bugli, Mile High Jazz Band leader and pianist. "The student music ensembles are great, and they deserve community support." The Carson Middle School Jazz Band directed by Nick Jacques, attends and competes at jazz festivals each year and performs at community events. The band is a zero-hour class designed to teach students about jazz - the music that began in America and spread throughout the world. 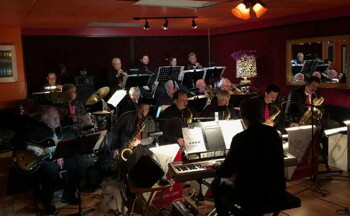 The Mile High Jazz Band, a professional big-band, plays regularly in northern Nevada, including monthly performances and quarterly Jazz and Poetry events at Comma Coffee and other venues. They present the annual Jazz & Beyond: Carson City Music Festival in August. This program is funded in part by a grant from the Nevada Arts Council. For more information, call Mile High Jazz Band at 775-883-4154 or see MileHighjazz.com. Mile High Jazz Band performs "Sampler for Sweethearts"
The Mile High Jazz Band will perform "Sampler for Sweethearts" at Living the Good Life, 1480 North Carson St., Carson City, on Tuesday, Feb. 13, 2018, from 7:30 to 9:30 p.m. This is the band's first performance at Living the Good Life. The Mile High Jazz Band with vocalist June Joplin will be joined by several poets and readers on Tuesday, March 13, 2018, 7:30-9:30 p.m., for an evening of big-band music and poetry on the theme "Springboards." Each poem will be followed by a related big-band tune. The event will be at CommaCoffee.com, 312 S. Carson Street, across the street from the state legislature building in Carson City. Admission is $5 at the door and free for age 18 and under. The program will feature Rita Geil, Wayne Carlson, Ray Hadley, Krista Lukas, Susan Sara Priest, Timothy Rhodes, and Amy Roby reading their original poems and selected works by other published poets. 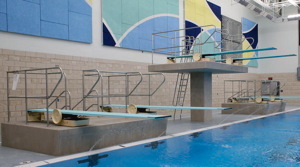 “Springboards” will include humorous and serious selections to entertain people of all ages. Mile High Jazz Band performances are funded, in part, by a grant from the Nevada Arts Council and the National Endowment for the Arts, and by private donations. For more information, call 775-883-4154, or visit MileHighJazz.com. The Mile High Jazz Band presents its second performance at Living the Good Life, 1480 N. Carson Street, Carson City, on Tuesday, April 10, 2018, from 7:30 to 9:30 p.m. There are a number of new tunes planned for this performance. The band will be joined by vocalist June Joplin, owner of Comma Coffee. Admission is free, and donations are greatly appreciated. The Mile High Jazz Band performs at Living the Good Life, 1480 N. Carson Street, Carson City, on Tuesday, May 8, 2018, from 7:30 to 9:30 p.m. The band is proud to report that it will be joined by vibrant and talented vocalist Jakki Ford, who is back after a brief absence. Admission is free, and donations are greatly appreciated. Living the Good Life welcomes you to enjoy at tasty meal prior to or during the performance. Reservations are not required, but if you wish to make a reservation, call the restaurant at 775-841-4663. Check the restaurant's Facebook page at https://www.facebook.com/livingthegoodlifecc. Pictured: Jakki Ford will sing with the Mile High Jazz Band on May 8th at Living the Good Life. The Mile High Jazz Band with vocalists Jakki Ford and June Joplin will be joined by six poets and readers for "Oh, Say Can You C?," a lively evening of big-band jazz music and poetry. The event will be on Tuesday, June 12, 7:30-9:30 p.m., in the courtyard adjacent to Comma Coffee, 312 S. Carson Street. In case of rain, the event will be inside CommaCoffee.com. Admission is $5, free for age 18 and under. The poems will be read by Rita Geil, Wayne Carlson, Krista Lukas, Susan Sara Priest, Timothy Rhodes, and Amy Roby. Some of the poems are originals by the readers. Each will be followed by a big-band tune that relates to the poem. This event is supported in part by public funding through a grant from the Nevada Arts Council and the National Endowment for the Arts. For more information, call the Mile High Jazz Band at 775-883-4154, or visit the web site: MileHighJazz.com. Photos: Singers Jakki Ford and June Joplin will perform with Mile High Jazz Band on June 12, 2018. Mile High Jazz Band Association, in cooperation with Carson Middle School, presents a five-day Jazz Camp with sessions for middle- and high-school musicians, weekdays June 13-19, in the band room at Carson Middle School, 1140 W. King St., in Carson City. The final day features a workshop/clinic with the US Navy 32nd Street Brass Band. Beginning and advanced sessions are open to students from Carson City and surrounding areas in northern Nevada and California. The introductory Jazz Explorers Camp, from 9:00 to 10:15 a.m. each day, is for students who are new to jazz or want to try a secondary jazz instrument. It includes learning the blues scale, improvisation skills, and swing and rock styles. The registration fee includes music, instruction, and snacks, and workshop with the US Navy 32nd Street Brass Band. The Jazz Ensemble Camp, from 10:30 a.m. to 12:00 p.m. each day, is for students who have at least one year of jazz experience or are high-school musicians, including graduated seniors. Students will prepare songs in various jazz styles, learn solos, and perform in a public concert. Registration fee includes music, instruction, snacks, workshop with the US Navy 32nd Street Brass Band and a free public performance with the Navy Band and the Mile High Jazz Band on Tuesday, June 19, 2018, at 7:00 p.m. at the McFadden Plaza stage in Carson City. Organizer-director is Nick Jacques, band director at Carson Middle School, with guest instructors from the Mile High Jazz Band. Advance registration is required. Students may register for one or both sessions. The fee for Jazz Explorers is $25 for the week; for Jazz Ensemble is $40; and for both is $55. Payment by cash or check payable to "MHJB" is due the first day of camp. Some scholarships will be available. To register or for more information, see www.cmsbands.org. Mile High Summer Jazz Camp is supported in part by a grant from the Nevada Arts Council and the National Endowment for the Arts. 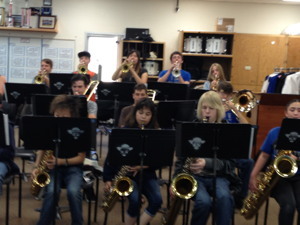 Photo: Middle- and high-school musicians at Mile High Jazz Camp last summer. 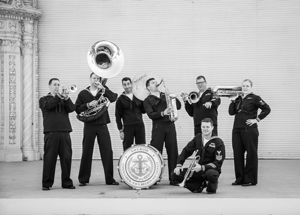 Navy Band Southwest provides a taste of New Orleans with its newest group, the 32nd Street Brass Band, on Tuesday, June 19, 2018, 7:00-9:30 p.m. at Bob McFadden Plaza, 223 W. Third Street, Carson City. The band, in Carson City during Navy Week, incorporates jazz, funk, Dixieland, and R&B, to keep everyone moving and entertained. Admission is free. The Mile High Jazz Camp Band, led by Nick Jacques, will open the concert. After a week of study with Jacques and a workshop with the 32nd Street Brass Band, these middle- and high-school musicians are eager to show their style. The Mile High Jazz Band with vocalist Jakki Ford will also perform, followed by all three bands combined for a rousing finale. People of all ages will enjoy the ambiance of the outdoor venue with several informal dining options. Please bring chairs. The jazz camp and this concert are supported in part by the Mile High Jazz Band with public funding through a grant from the Nevada Arts Council and the National Endowment for the Arts. For more information, call the Mile High Jazz Band at 775-883-4154, or visit the web site: MileHighJazz.com. The Mile High Jazz Band performs at Living the Good Life, 1480 N. Carson Street, Carson City, on Tuesday, July 10, 2018, from 7:30 to 9:30 p.m. Admission is free, and donations are greatly appreciated. Mile High Jazz Band Association and Carson City present the 15th Annual Jazz & Beyond Music & Art Festival. It features 17 days of Music, Art, and Film at multiple venues in Carson City, from August 3 through 19, 2018. "Jazz & Beyond is a homegrown event celebrating the talent of our region and relying on many local music fans who donate their time and effort," said planning committee co-chair David Bugli, President of the Mile High Jazz Band Assoc. "Sponsors and volunteers help us make the event one of the best in the area, and keep performances admission free." The festival opens on Friday, August 3, at the historic Bliss Mansion, northeast corner Mountain and Robinson Streets. An art show and sale on the porch at 4:00 p.m. features artists from the Nevada Artists Association. Music begins at 4:30 p.m. with the Rocky Tatarelli Band, followed at 6:30 p.m. by Cherie and John Shipley with the Take This band. Two special events will be a talk and performance on World Percussion with Chance Utter assisted by Andy Heglund, The Batamba Collective, and members of the UNR World Percussion Ensemble on Thursday, August 9, at the Brewery Arts Center Performance Hall, and a talk and performance on Virginia City's Jazz Era by John Shipley and friends on Thursday, August 16, at the Nevada State Museum. The third annual “A Day at the Silver Saddle Ranch,” 2648 Carson River Road on the east side of Prison Hill, will be on Sunday, August 12, beginning at 2:00 p.m. Bluegrass and Western music, live animals, and food trucks will be featured. 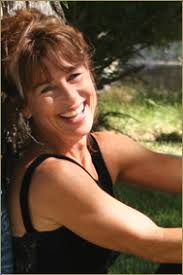 Musicians are Chris Bayer, Dale Poune, the Sierra Sweethearts, and more. Free concerts also will be held at the Capital Amphitheater, Nevada State Railroad Museum, Carson Mall, Comma Coffee Courtyard, Bob McFadden Plaza, Brewery Arts Center, and other Carson City venues. Favorite and new performing groups include The Red Tango, Batamba Collective, Reno Jazz Orchestra, Mile High Jazz Band, and many more. Photo on left: Cherie and John Shipley with the Take This band will open the Jazz & Beyond - Carson City Music & Art Festival at the Bliss mansion on August 3. 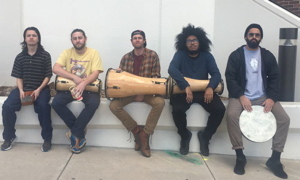 Photo on right: Batamba Collective (World Percussion Ensemble) will perform at the Brewery Arts Center Performance Hall on August 9. Media release – March 30, 2018: Mile High Jazz Band Association and Carson City present the 15th Annual Jazz & Beyond Festival. It features 17 days of Music, Art, and Film at multiple venues in Carson City, August 3-19. "Jazz & Beyond is a homegrown event celebrating the talent of our region and relying on many local music fans who donate their time and effort," said committee co-chair David Bugli, President of the Mile High Jazz Band Assoc. "Sponsors and volunteers help us make the event one of the best in the area, and keep most performances admission free." The festival opens on Friday, August 3, at the historic Bliss mansion, corner Mountain and Robinson Streets. An art show and sale on the porch at 4:00 p.m. features artists from the Capital City Arts Initiative and the Nevada Artists Association. 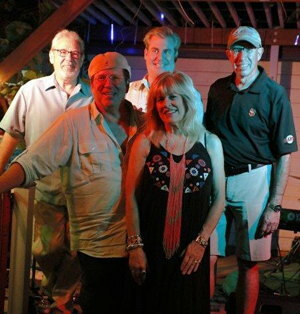 Music on the lawn begins at 4:30 p.m. followed by by Cherie and John Shipley with Take This band at 6:30 p.m. The third annual "A Day at the Silver Saddle Ranch," 2648 Carson River Road on the east side of Prison Hill, will be on Sunday, August 12, beginning at 2:00 p.m. Great music, live animals, and food trucks will be featured. Free concerts also will be held at the Capital Amphitheater, Nevada State Railroad Museum, Comma Coffee Courtyard, Bob McFadden Plaza, Brewery Arts Center, and other Carson City venues. A full schedule of events will be available on the website JazzCarsonCity.com. For sponsor and volunteer opportunities, call 775-883-4154. The festival is being listed at the "Blues Festival Guide 2018." 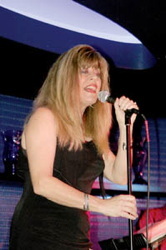 Pictured: Photograph of vocalist Cherie Shipley, who will be performing with Take This on the opening night of the festival. As part of the "Jazz & Beyond Music Festival," the Millennium Bugs will play from 5:00 to 7:00 p.m. at the Foreman-Roberts House Museum on Saturday, Aug. 4, 2018, for the Carson City Historical Society Ice Cream Social. The event is free. Ice cream may be purchased at the event. The website for the Carson City Historical Society is http://cchistorical.org. 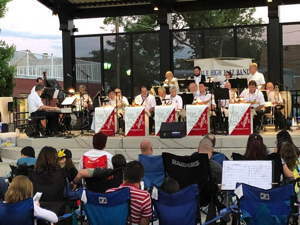 The Mile High Jazz Band performs at Bob McFadden Plaza on Tuesday, Aug. 14, 2018, from 7:30 to 9:30 p.m. The concert is part of the Jazz & Beyond Music Festival. Seating may be limited, so audience members are encouraged to bring lawn chairs. David & Friends, a jazz combo led by David Bugli, will perform for the Wine Walk on Saturday, September 1, 2018, from 2:00 to 4:00 p.m. in the Nevada Artists Association Gallery (inside the main Brewery Arts Center building, 449 W. King St., Carson City). Join Carson City Downtown Business Association businesses for one of the most fun social events held in Downtown Carson City. On the first Saturday of every month, participants can stroll to over 35 locations pouring wine, providing entertainment, and offering special deals for wine walkers. At the end of every wine walk, at 5:00 p.m. sharp, there is a raffle in Alatte Wine and Coffee Bar at the Carson Nugget with many prizes donated by the downtown businesses. Raffle tickets are provided with your paid entry into the wine walk. Did you have a great experience at one of the locations? Don't forget to cast your ballot, also provided, for your favorite wine walk stop. Purchase your tickets at The Carson Nugget, Carson Jewelry & Loan, Touched By Angels, Purple Avocado, Cactus Jacks Casino, The Brewery Arts Center, or Comma Coffee for $15 without an official wine walk glass or $10 with the official wine walk glass. The Mile High Jazz Band with vocalist Jakki Ford will be joined by seven poets and readers for "Changing Colors," a lively evening of big-band jazz and poetry. The event will be on Tuesday, September 11, 2018, 7:30-9:30 p.m., in the courtyard adjacent to Comma Coffee, 312 S. Carson Street. In case of rain, the event will be inside Comma Coffee. Admission is $5, free for age 18 and under. The poems, including some originals by the readers, will be read by Rita Geil, Ursula Carlson, Wayne Carlson, Krista Lukas, Susan Sara Priest, Timothy Rhodes, and Amy Roby. Each reading will be followed by a big-band tune that relates to the poem. This event is supported in part by public funding through grants from the Nevada Arts Council and the National Endowment for the Arts, and from Nevada Humanities and National Endowment for the Humanities. For more information, call the Mile High Jazz Band at 775-883-4154, or visit the web site: MileHighJazz.com. Photo: Singer Jakki Ford will perform with Mile High Jazz Band on September 11. David & Friends, a jazz combo led by David Bugli, will perform for the Wine Walk on Saturday, October 6, 2018, from 2:00 to 4:00 p.m. in the Nevada Artists Association Gallery (inside the main Brewery Arts Center building, 449 W. King St., Carson City). Enjoy an evening of big-band music with vocalist Jakki Ford on Tuesday, October 9, 2018, 7:30 to 9:30 p.m. at Living the Good Life Bisto, 1480 N. Carson Street in Carson City. Admission is free and donations are greatly appreciated. The program, Autumn Big-band Jazz, presents the 17-member Mile High Jazz Band playing favorite and new big-band songs. The concert celebrates Harmony for Humanity as part of World Music Days, an annual global event affirming the ideals of tolerance, friendship, and shared humanity, inspired by the life and work of journalist and musician Daniel Pearl. The performance also commemorates National Arts and Humanities month, a coast-to-coast recognition of the importance of culture in America. Mile High Jazz Band events are supported in part by a grant from the Nevada Arts Council and the National Endowment for the Arts. For information about Autumn Big-band Jazz and the Mile High Jazz Band, call 775-883-4154, or see the website MileHighJazz.com. For information on other events at Living the Good Life, see facebook.com/livingthegoodlifecc. Photo: Jakki Ford will perform with Mile High Jazz Band at Living the Good Life on October 9. 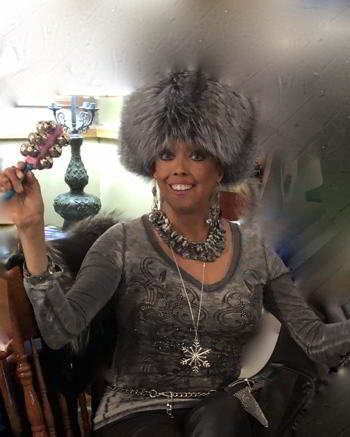 Enjoy an evening of big-band music with vocalist Jakki Ford on Tuesday, November 13, 2018, 7:30 to 9:30 p.m. at Living the Good Life, 1480 N. Carson Street in Carson City. Admission is free and donations are greatly appreciated. The program, November Jazz, presents the 17-member Mile High Jazz Band playing favorite and new big-band songs, including "Time Check" and "The Song is You," with sax, trumpet, and drum solos. 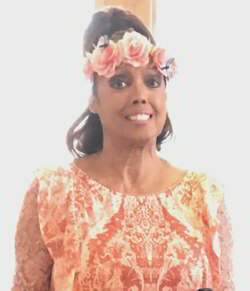 Jakki Ford will be featured in “Just Friends,” "Orange Colored Sky," "The Man I Love," and more. Trumpet player Wayne Theriault, best known for his imaginative instrumental solos, will sing his own arrangement of "Give Me the Simple Life." Mile High Jazz Band events are supported in part by a grant from the Nevada Arts Council and the National Endowment for the Arts. For information about November Jazz and the Mile High Jazz Band, call 775-883-4154, or see the website MileHighJazz.com. For information on other events at Living the Good Life, see facebook.com/livingthegoodlifecc. 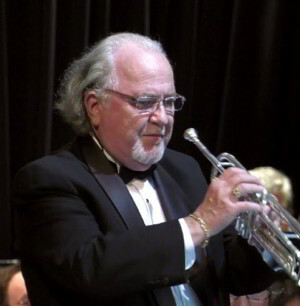 Photo: Wayne Theriault will play trumpet and sing with Mile High Jazz Band on November 13. 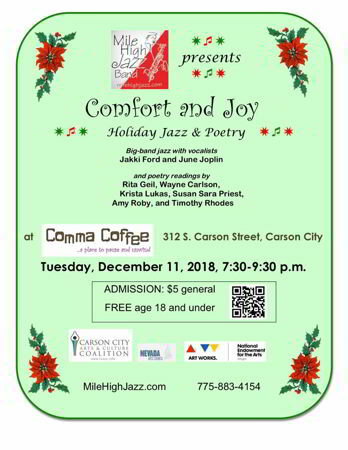 Mile High Jazz Band Performs "Comfort & Joy"
The Mile High Jazz Band performs "Comfort & Joy" (Jazz and Poetry) at CommaCoffee.com on Tuesday, December 11, 2018, from 7:30 to 9:30 p.m. The band will be joined by vocalists Jakki Ford and June Joplin in several tunes. Poetry will be read by Rita Geil, Amy Roby, Krista Lukas, Susan Sara Priest, Timothy Rhodes, and Wayne Carlson. Admission is $5 general and free for age 18 and under. The Mile High Jazz Band performs "Cool Jazz in January" at Living the Good Life, 1480 N. Carson Street, Carson City, on Tuesday, January. 15, 2019, from 7:30 to 9:30 p.m. Note that in a break from tradition, this concert will be on the THIRD TUESDAY of the month, rather than the usual second Tuesday of the month. Admission is free, and donations are greatly appreciated. Mile High Jazz Band Performs "Jazz Sampler For Sweethearts"
Treat your Valentine to A Jazz Sampler for Sweethearts, an evening of sweet and hot big-band music by the Mile High Jazz Band with singer Jakki Ford at Living the Good Life Bistro, 1480 N. Carson Street, in Carson City on Tuesday, February 12, 2019, 7:30 to 9:30 p.m. Admission is free, donations welcome. Jazz Sampler for Sweethearts features the 17-member band playing jazzy versions of favorite love songs for Valentine's Day, and other swinging, big-band selections. Highlights of the evening include "The Way You Look Tonight," "Prelude to a Kiss," and "It Could Happen to You." The performance is funded, in part, by a grant from the Nevada Arts Council and the National Endowment for the Arts. For more information about the Mile High Jazz Band, call 775-883-4154 or see milehighjazz.com. Photo: Vocalist Jakki Ford will be featured with Mile High Jazz Band on February 12 at Living the Good Life. David & Friends, a jazz combo led by David Bugli, will perform for the Wine Walk on Saturday, March 2, 2019, from 2:00 to 4:00 p.m. in the Nevada Artists Association Gallery (inside the main Brewery Arts Center building, 449 W. King St., Carson City). The Mile High Jazz Band performs a "Jazz & Poetry" event at CommaCoffee.com on Tuesday, March 12, 2019, from 7:30 to 9:30 p.m. The theme for this event is "Hang Ups." The band will be joined on vocals by Jakki Ford. The poetry readers are Rita Geil (our official Poet Wrangler), Krista Lukas, Susan Sara Priest, Timothy Rhodes, and Amy Roby. It's "big-band jazz times three" when the Mile High Jazz Band, Carson High Jazz Band, and Carson Middle School Jazz Band present the 16th annual combined Jazz Extravaganza concert, on Tuesday, March 19, at 7:00 p.m., in the Bob Boldrick Theater at the Carson City Community Center, 851 E. William Street, Carson City. The Extravaganza is sponsored by the Mile High Jazz Band Association and the Carson City Band Association as a benefit for Carson City school instrumental music programs. Tickets prices are $10 general admission and free for youth age 18 and under. Tickets can be purchased in advance from Carson High and Carson Middle School music students, at the Nevada Day Office (716 N. Carson Street), online at MileHighJazz.com, or at the door. In addition to tickets, ads in the concert program are available, beginning at $30 for 1/8 page. For information, call the Mile High Jazz Band at 775-883-4154. This year, the Extravaganza will feature three big bands, vocalist Jakki Ford, and an intergenerational combo performance. The traditional grand finale, combining the forces of all the musicians, will be “A Little Blues, Please,” by Sammy Nestico. Refreshments and raffle prizes will be on sale in the lobby. "We're so happy to perform with the high school and middle school jazz bands again," said David Bugli, Mile High Jazz Band leader and pianist. "These award-winning student ensembles are impressive and deserve community support." The Carson High Jazz Band, directed by Bill Zabelsky, and the Carson Middle School Jazz Band, directed by Nick Jacques, attend and compete at jazz festivals each year and perform at community events throughout Carson City. The bands are zero-hour classes designed to teach students about jazz - the music that began in America and spread throughout the world. 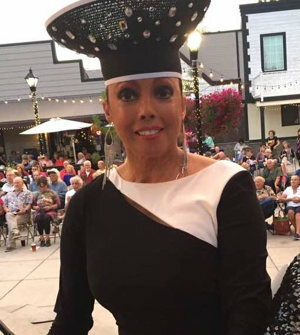 The Mile High Jazz Band, a professional big-band, plays regularly in northern Nevada, including monthly performances and quarterly Jazz and Poetry events in Carson City. They present the annual Jazz & Beyond: Carson City Music Festival each August. This concert is funded in part by a grant from the Nevada Arts Council. For more information, call Mile High Jazz Band at 775-883-4154 or see MileHighjazz.com. Most Comma Coffee and Living the Good Life gigs are on the second Tuesday of each month.